CFA and Northwest Chicago Film Society have lots in store for you at this year’s home movie day, which takes place Saturday, October 19th at the accommodating Chicago History Museum. This international event (started 11 year ago by the Center for Home Movies) provides a unique opportunity for those with 16mm., 8mm, and/or Super 8mm home movies to have their films inspected and projected by local archivists and skilled projectionists. 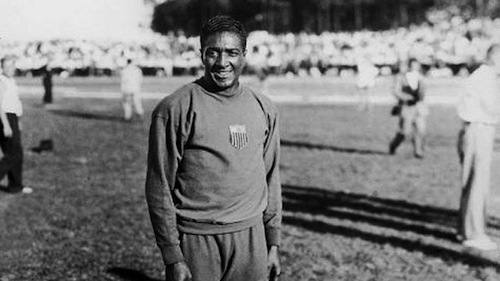 Representing Bronzeville: The home movies of Olympic Champion & politician, Ralph Metcalfe! Once called “the worlds fastest human,” two-time track & field Olympian Ralph Metcalfe nabbed glory in both Los Angeles in 1932 and in Berlin in 1936. While a skilled competitor in his own right, Metcalfe is likely best remembered for his part in the gold medal-winning 4×100 relay team that competed in Berlin. Following military service and a career in the private sector, Metcalfe started his political career by representing Chicago’s Third Ward on the city council in 1949. The Democrat took office in the Senate in 1971, and represented Illinois there until his death in 1978. We are very excited to share personal home movies from the Ralph Metcalfe Collection at this year’s home movie day! Expect to see 1957 scenes from inside Chicago’s Third Ward Office, mid-century track & field events, Queen Elizabeth II’s 1959 visit to Chicago and a 1961 bake sale held at Howalton Day School, the first African American private school in Chicago. Ralph’s son, who is working tirelessly to preserve and promote his father’s legacy, will be on hand at Home Movie Day to narrate his family’s home movies. Representing Ravenswood Manor: teenage antics shot on Super 8 sound film! Back in the early 1970′s, a gaggle of Ravenswood Manor teens documented their wild neighborhood antics and shot chaotic short films on their Super 8mm cameras. Go back in time to an era of Yes & Pink Floyd t-shirts(! ), wood-panelled basements, Chicago River explosions and unsupervised pyrotechnics. 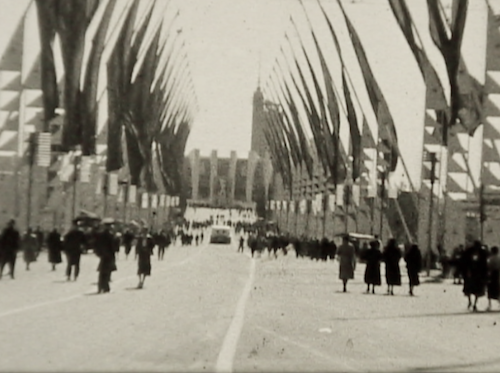 and as a special treat, newly acquired CFA home movies of the 1933 Chicago’s World’s Fair! Home Movie Day 2013 is from 11AM-3PM, with the curated program beginning at 2PM. Folks with celluloid home movies should feel free to mozy on over anytime between 11AM-2PM to have their films inspected and, if in good shape, projected. For more info on the event, click over to our HMD 2013 events page. Not in Chicago? Check out the *official* and growing list of Home Movie Day locations here (via The Center for Home Movies). Happy Home Movie Day to all! You may remember back in April when CFA announced the acquisition of three experimental films by Chicago-based filmmaker & designer Lawrence Janiak (in case you missed it, you can read about it here)….. well, we are THRILLED to announce that Larry has donated more of his films (and affiliated ephemera) to CFA! 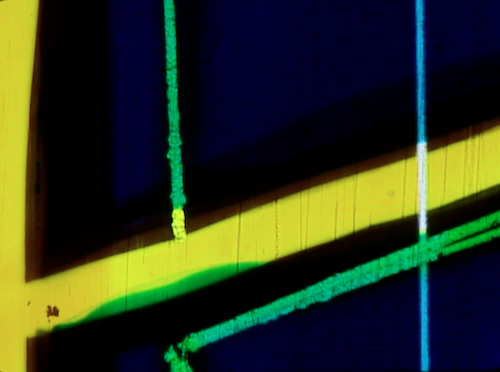 Allegro, Lawrence Janiak, 1960, 16mm., Color, Sound, 3 min. 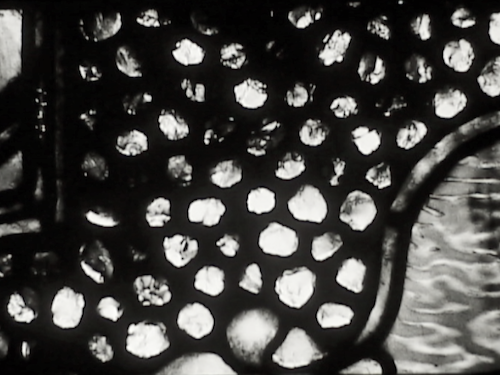 Glasshouse, Lawrence Janiak, 1964, 16mm., B&W, Sound, 7 min. 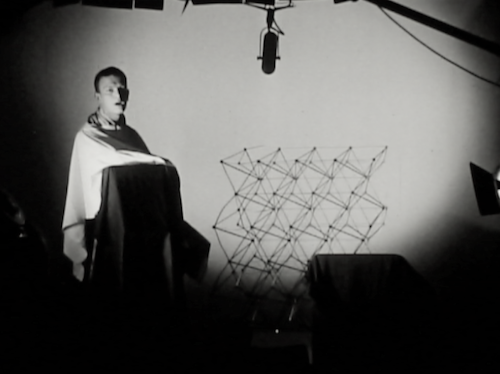 Agamemnon in New York, Lawrence Janiak & Wayne Boyer, 1960s, 16mm., B&W, Sound, 4.5 min. Made with fellow Institute of Design classmate and Goldsholl Associates colleague, Wayne Boyer, Agamemnon in New York tells a humorous tale of Agamemnon visiting a modern day New York City. Janiak delivers the story (outtakes and all), while Boyer films it. 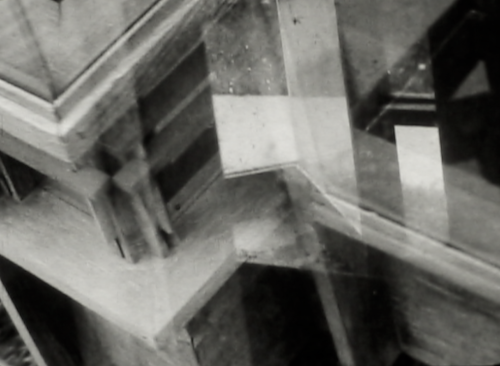 Hale House, Lawrence Janiak, 1965, 16mm., B&W, Sound, 11 min. Before we dive into this one, let’s first cover some local history: The Vivekananda Vedanta Society of Chicago is a branch of the Hindu Ramakrishna Order whose motto is “For one’s own liberation and for the welfare of the world.” The historical roots of the society can be traced back to Swami Vivekananda’s visit to Chicago in the July 1893 to attend the World’s Parliament of Religions. During his 1893 visit, Mrs. and Mr. George Hale’s home on 120 E. Dearborn Ave served as Swamiji’s headquarters in the Midwest. Thirty years later, Swami Jnaneswarananda, a monk of the Ramakrishna Order arrived in Chicago to start a center in the city of Swami Vivekananda’s triumph, establishing the Vivekananda Vedanta Society of Chicago and the Hale’s home as its official headquarters. 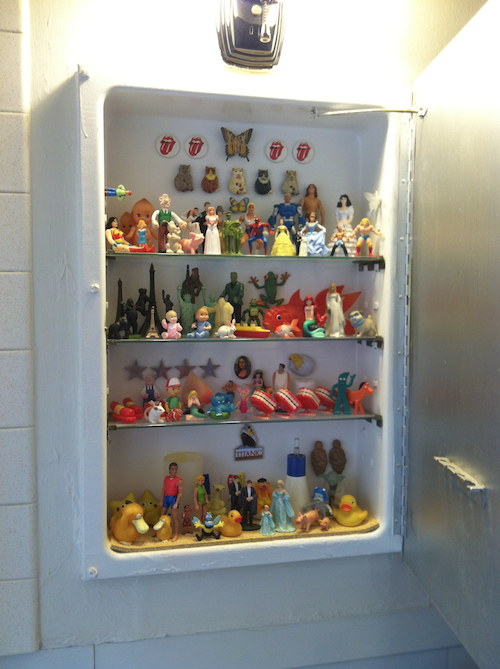 With a devout interest in Eastern religions and as a member of the Society (now headquartered in the southwest suburb of Homer Glen), Larry went to the Hale House and filmed architectural details both inside and outside of the home. These images are paired with traditional Hindu music and prayers. The Hale home (located at 1415 North Dearborn Street) was demolished in the late 1960′s and a high rise apartment complex built on the site. 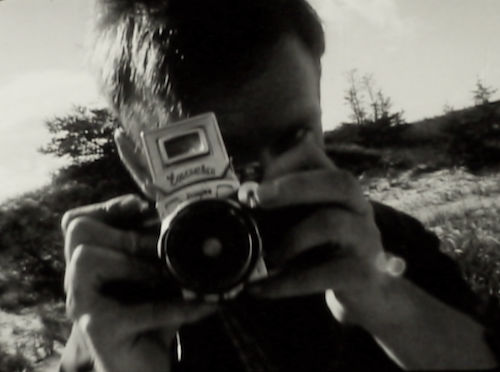 Life & Film, Lawrence Janiak, Robert Stiegler & Jeffrey Pasco, 1966, B&W, Sound, 4.5 min. Chicago based designers and artists experiment (and have fun) with their cameras to the tune of “Tomorrow Never Knows” by the Beatles. This film about filmmaking was shot at the nearby Michigan dunes and Chicago’s Humboldt Park. 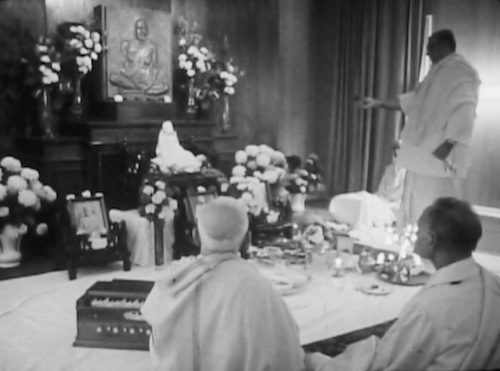 Vedanta Temple Dedication Ceremony, Lawrence Janiak & Steohen Rose, 1966, 16mm., B&W, Sound, 25 min. A documentary film made by Larry Janiak and Stephen Rose for Swami Bhashyananda about a Vendata Temple Dedication in Chicago’s Hyde Park neighborhood (5423 S Hyde Park Boulevard to be exact). Hindus, Christians, Unitarians, Jews, Muslims and Buddhists unite to celebrate the dedication of the Vivekanada Vedanta Society of Chicago’s new home. 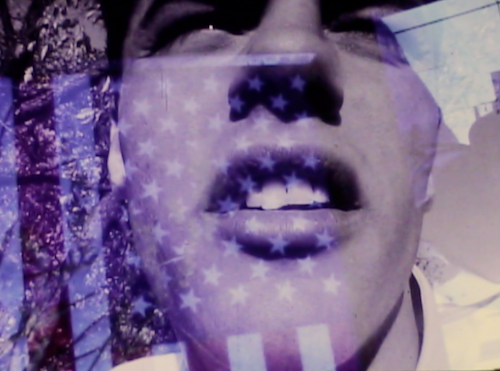 Homage #5 [unfinished], Lawrence Janiak, 1970, 16mm., Color, Sound, 6 min. An unfinished film or “preliminary sketch” by Larry that he describes as “an early experiment of collage image editing style with a slow pace spoken narration soundtrack, with a non-literal relationship between the two.” The images seen are those of a rural Wisconsin, while the audio was transferred from an audiocassette recording of a Baba Ram Dass lecture at the University of Illinois. Stay tuned for more news on this exciting new acquisition!